The race for quantum computing is on: Industry giants, such as Google, IBM, and Microsoft, and leading international research centers and universities are involved in the global effort to build a quantum computer. It is not known yet when this new technology can become a reality, but the world is getting ready. The greatest expectation about the quantum computer is that it could break the security of all classical data transfer networks. Today, sensitive data such as personal communication or financial information are protected using encryption algorithms that would take a classical supercomputer years to crack. A quantum computer could conceivably do this in a few seconds. Luckily, quantum technologies come with a way of neutralizing this threat. Modern classical cryptographic algorithms are complexity-based and can remain secure only for a certain period of time. Unlike its classical counterpart, quantum cryptography relies on the fundamental laws of physics, which can guarantee security of data transmission forever. The operation principle is based on the fact that one cannot copy an unknown quantum state without altering the original message. This means that a quantum communication line cannot be compromised without the sender and the receiver knowing. Even a quantum computer would be of no use to eavesdroppers. Photons — the quanta of light — are the best carriers for quantum bits. It is important to emphasize that only single photons can be used, otherwise an eavesdropper might intercept one of the transmitted photons and thus get a copy of the message. 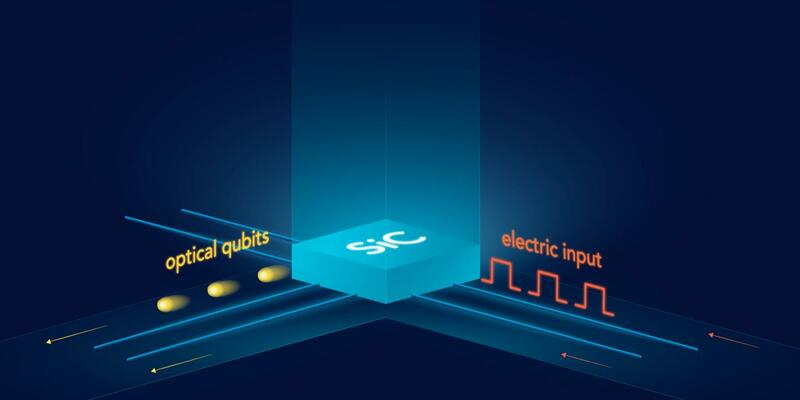 The principle of single-photon generation is quite simple: An excited quantum system can relax into the ground state by emitting exactly one photon. From an engineering standpoint, one needs a real-world physical system that reliably generates single photons under ambient conditions. However, such a system is not easy to find. For example, quantum dots could be a good option, but they only work well when cooled below ?200 degrees Celsius, while the newly emerged two-dimensional materials, such as graphene, are simply unable to generate single-photons at a high repetition rate under electrical excitation. The MIPT researchers see the solution in silicon carbide, a semiconductor material long forgotten in optoelectronics. "In 2014, we were studying diamond and turned our attention to silicon carbide almost by accident. We figured it had vast potential," says Dmitry Fedyanin. However, as he explains, electrically driven emission of single photons in this semiconductor was only achieved one year later, in 2015, by an Australian research team. Surprisingly, silicon carbide is a material that started the whole of optoelectronics: The phenomenon of electroluminescence, in which an electric current ?auses a material to emit light, was observed for the first time in silicon carbide. In the 1920s, the material was used in the world's first light-emitting diodes (LEDs). In the '70s, silicon carbide LEDs were mass-produced in the Soviet Union. However, after that, silicon carbide lost the battle against direct-bandgap semiconductors and was abandoned by optoelectronics. Nowadays, this material is mostly known for being extremely hard and heat-resistant — it is used in high-power electronics, bulletproof vests, and the brakes of sports cars produced by Porsche, Lamborghini, and Ferrari. Together with his colleagues, Fedyanin studied the physics of electroluminescence of color centers in silicon carbide and came up with a theory of single-photon emission upon electrical injection that explains and accurately reproduces the experimental findings. A color center is a point defect in the lattice structure of silicon carbide that can emit or absorb a photon at a wavelength to which the material is transparent in the absence of defects. This process is at the heart of the electrically driven single-photon source. Using their theory, the researchers have shown how a single-photon emitting diode based on silicon carbide can be improved to emit up to several billion photons per second. That is exactly what one needs to implement quantum cryptography protocols at data transfer rates on the order of 1 Gbps. Study co-authors Igor Khramtsov and Andrey Vyshnevyy point out that new materials are likely to be found, rivaling silicon carbide in terms of brightness of single-photon emission. However, unlike silicon carbide, they will require new technological processes to be used in mass production of devices. By contrast, silicon carbide-based single-photon sources are compatible with the CMOS technology, which is a standard for manufacturing electronic integrated circuits. This makes silicon carbide by far the most promising material for building practical ultrawide-bandwidth unconditionally secure data communication lines. The study was supported by the Russian Science Foundation (17-79-20421). Original research paper: I.A. Khramtsov, A.A. Vyshnevyy, and D.Yu. Fedyanin, "Enhancing the brightness of electrically driven single-photon sources using color centers in silicon carbide," npj Quantum Information 4, 15 (2018).